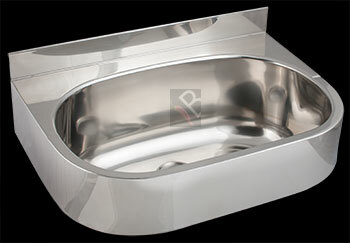 Oval KA Hand Wash Basin, 480 x 335 x 225 mm deep. Manufactured from Grade 304 (18/10) Stainless Steel, 1,2 mm gauge. Unit to include a one piece pressed bowl, with a 40 mm waste outlet, with a 50 mm splash back and 100 mm rounded apron. Basin to be fixed to the wall with 4 x 6 mm anchor bolts (bolts elsewhere measured). bove: The Oval KA hand wash basin is popular in the food industry, hospitals and clinics. It is a small compact basin which is hygienic and designed specially for hand washing. IR taps or foot/knee operated taps can be used. Foot or knee operated valves . When using a foot valve a tap is not required, only a dedicated spout. Foot valves are popular with the Oval A hand wash basin. It allows hands free operation for use in the food and hospital industries. The foot valve is connected to a basin spout which is mounted on top of the Oval A basin. The foot valve uses pre-mixed water or cold water. 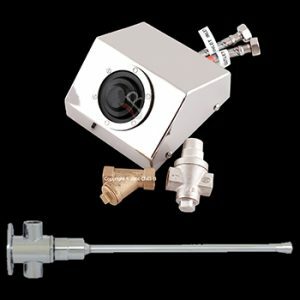 Pre-mixed water is kept below 42°C through the installation of a thermostatic mixing valve (W-15/3 or CO-EL-X60.